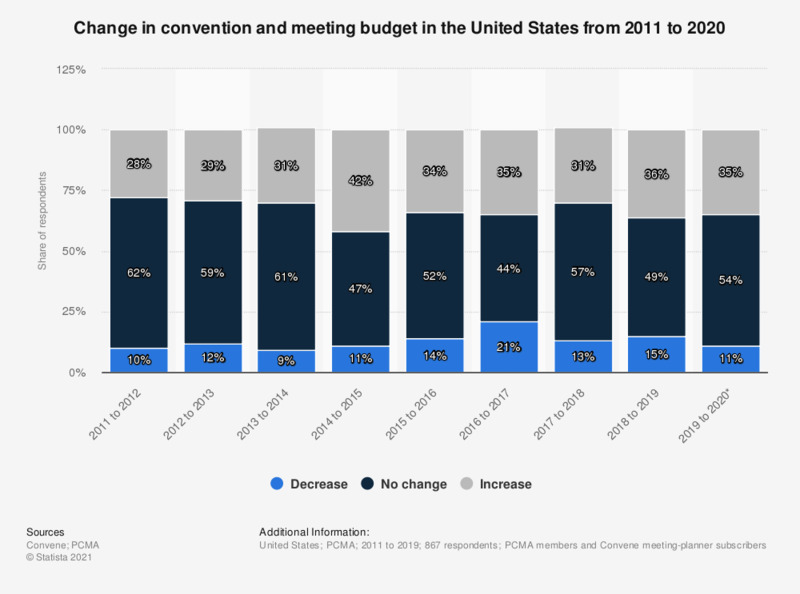 This statistic shows the reported change in convention and meeting budgets in the United States from 2011 to 2018. The source indicates that the majority of respondents (44 percent) reported no change in their convention and meeting budget from 2016 to 2017, while 35 percent reported a budget increase. According to 13 percent of respondents 2018 budgets are expected to decrease. Time necessary for environment-friendly exhibiting solutions to bring ROI in the U.S.
Do you anticipate your spending on environment-friendly exhibiting solutions will increase, decrease, or remain the same in the coming year? What percentage of your total exhibiting budget is currently spent on environment-friendly solutions? If you were to invest in environment-friendly exhibiting solutions today, how soon would you expect to see a return on investment? How important will trade fairs be for your company within the next five years? Is your business going to participate in more, fewer, or the same amount of trade fairs in 2017/2018 or 2018/2019?